In the course of my many years watching live theater, I have, several times, been fascinated when something goes wrong during a performance. And I’ll tell you why a bit later. 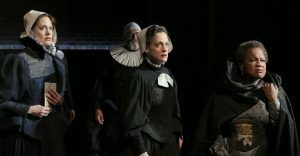 Conceived and developed by Abigail Killeen, written by Rose Courtney and directed by Karin Coonrod, the Theatre at St. Clement’s production of BABETTE’S FEAST owes more to the original Isak Dinesen short story than to the Oscars-winning 1987 film of the same name. Set in the late 1800s in the small village of Berlevǻg, Norway, it tells the story of two lovely sisters, Martine (Abigail Killeen) and Philippa (Juliana Francis Kelly), who eschew romance in order to tend to their pious pastor father. Many years after his death, they are shocked to find a French refugee, Babette (Michelle Hurst) on their doorstep. Bereft by the loss of her husband and son in the civil strife, she asks only to serve them without pay. Despite rumors in the village that Babette is a political arsonist, the kindly sisters take her into their home. Director Coonrod has staged this piece with a Nordic simplicity and surrounded her leads with a superb ensemble: Jo Mei, Elliot Nye, Steven Skybell, Sorab Wadia, Sturgis Warner and Jeorge Bennett Watson, all of whom play multiple parts to perfection. But back to the story: Soon after Babette learns that she has won 10,000 francs in a French lottery, she tells the sisters that, for the 100th anniversary of their late father’s birth, she wishes to prepare “a real French dinner” for Martine, Philippa and their guests. The sisters are stunned and the village is dismayed—and here’s where the wheels come off! Then Ms. Kelly asks the audience if they mind if the cast just picks up from where they left off. Ms Swan cues the cast and Babette’s dinner proceeds magnificently, as does the whole cast, especially Michelle Hurst. Those who only know Ms. Hurst from TV’s Orange Is the New Black, would be astounded to hear how beautifully she speaks French! For my part, I was astounded by the compassion and professionalism of the cast and crew. BABETTE’S FEAST is a story about the miracle of small graces and tender mercies. Clearly, this company knows all about that. Running time: 90 minutes without intermission. From left to right, Juliana Francis Kelly, Steven Skybell, Abigail Killeen and Michelle Hurst in “Babette’s Feast.” Photo by Carol Rosegg.